Born of a desire to decorate an ordinary 1960s church, artists in this tiny Italian village are making the world’s largest mosaic. Woman from the Mosaico Paulista group have come from Sao Paolo in Brazil to take part in the project. They are using recycled materials to create the Gaudi-inspired mosaic. 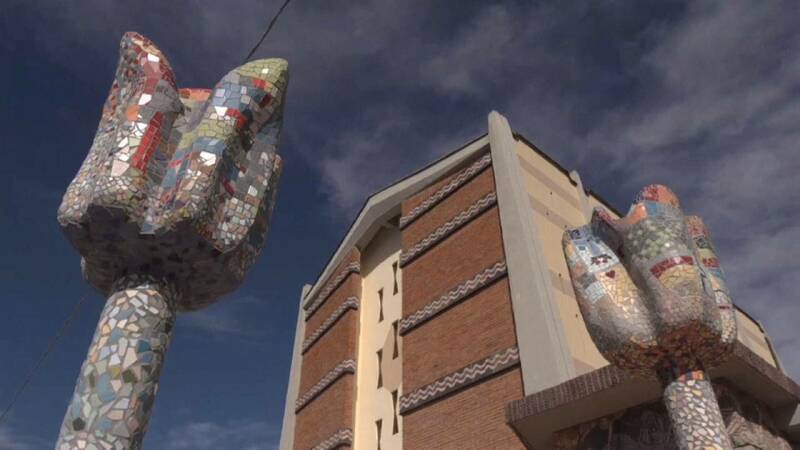 Carpenito believes the mosaic is an appropriate metaphor for the impoverished community of Indicatore – a village born in the late sixties between a railway line and an industrial zone. The project currently stretches around 800 metres and Carpenito believes it to be the biggest mosaic in Europe. She hopes that eventually it will be as big as 3,000 metres, covering pavements inside and outside the church and interior walls. According to the Guinness World Records, the largest ceramic mosaic is a 1,570.2 m² mural built on the Red River Dyke in Hanoi, Vietnam.